Beer collaborations happen frequently and usually with other breweries; however, over the past few years, I have noticed a different type of collaboration throughout Texas. Breweries all over the state are partnering with various charities in their communities by creating a beer, in many cases inspired by the charity, and donating a portion of their sales to the organization. For this piece, I have chosen six examples from Texas, but these are just a few examples of the many collaborations that occur all over the state. 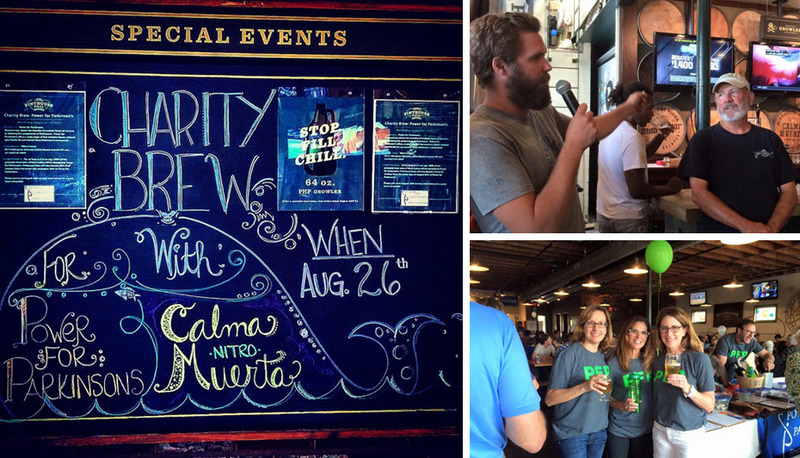 For each of the brews, I reached out to the brewery to find out what inspired the beer and why they partnered with a particular charity. 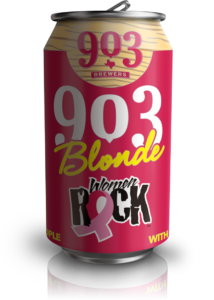 903 Blonde is a smooth, easy drinking beer that has more body and flavor than your typical American blonde. 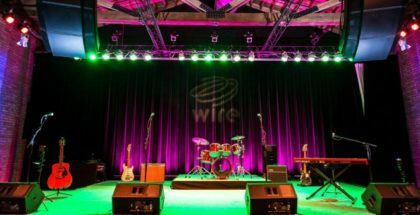 Jeremy Roberts is 903 Brewer’s founder and here’s what he had to say about choosing the charity Women Rock. “Breast cancer awareness gets a lot of attention in October but we feel it needs attention year around and Women Rock preaches that early detection is key to prevention. We designed the pink can to help raise awareness about getting screened early. 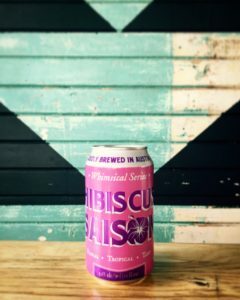 This saison is part of Adelbert’s Whimsical series brewed with hibiscus flowers and dry hopped with Citra, giving the beer a vibrant pink color that helped inspire the brewery to partner with the Breast Cancer Resource Center. I spoke with Sarah Haney, General Manager, to find out more about their inspiration and why they chose BCRC. “Scott and I developed this recipe together. While we were making test batches, we were impressed by the pink hue. At the time, Scott offered a financial incentive to employees if we developed a beer that went to market. I asked if we could donate to a charity instead. My mom is a 10+ year breast cancer survivor and the bright pink color was a perfect fit. 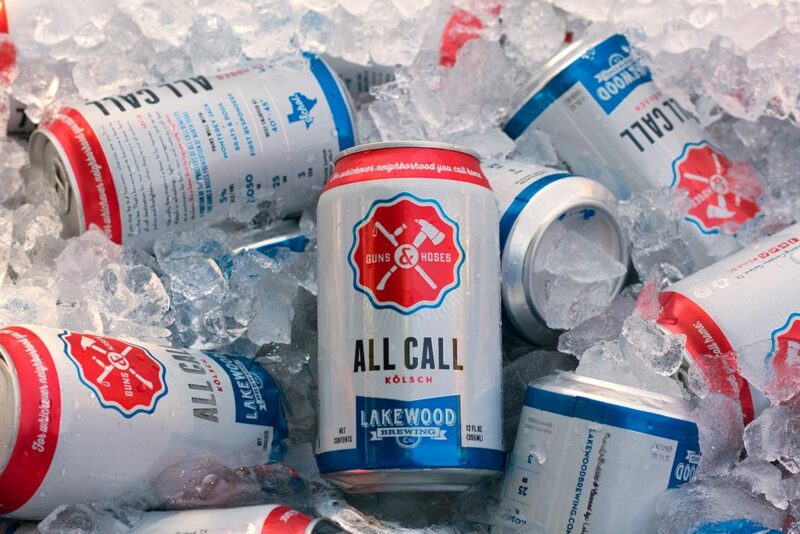 Lakewood Brewing Co. collaborated with Guns & Hoses Foundation of North Texas from the very beginning of this beer. “We wanted to create a beer that everyone could enjoy”, says founder and president Wim Bens. 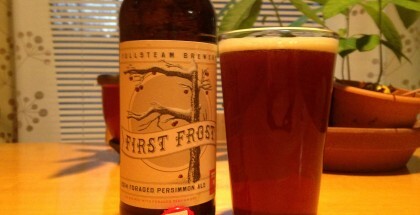 They settled on a kölsch style beer made with high-quality ingredients that is light, effervescent and very approachable to the non-craft beer drinker. Here is what Bens had to say about the inspiration and why they chose Guns and Hoses as their partner. “As a craft brewery, we pride ourselves on being a contributing member of our community. We wouldn’t be where we are today without the dedicated local fans who come to our brewery and purchase our beer at bars and retailers. We recognize that it’s a beautifully simple symbiotic relationship. Since our very beginning we’ve hosted charity organizations at tours and that has built to our partnership with Guns and Hoses, the 100 Club, and our “Brewing Good Sundays” at the Taproom, where a dollar of every pint sold on Sundays at the Taproom goes to a different local or national charity each month. So far, they have had the privilege of supporting the following non-profits: Camp El Tesoro de la Vida, Pedal Against PTSD, Angie’s Friends, Equest and currently Education Opens Doors. 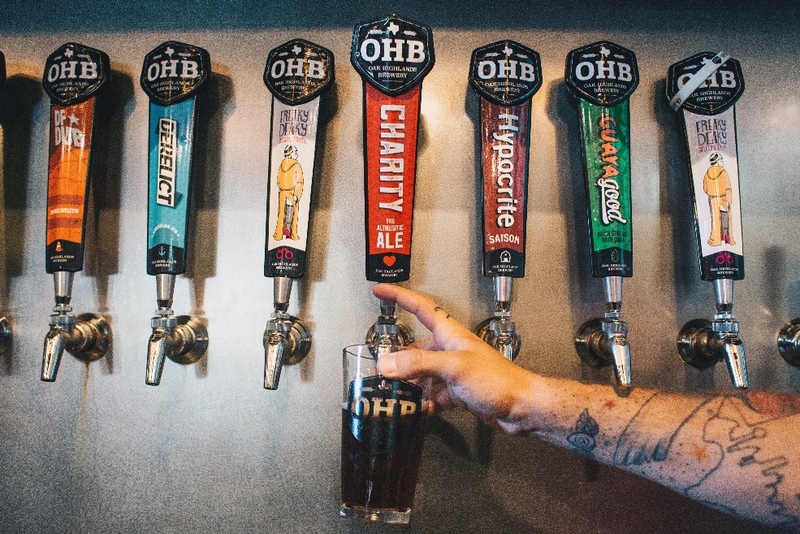 In addition to Charity, OHB also gives 10% of the proceeds from the sale of its Oktoberfest beer to a different local breast cancer awareness charity. “Breast cancer has touched many lives, including those closely connected with OHB. Because the traditional Oktoberfest season and Breast Cancer Awareness Month loosely coincide, we thought it was a perfect opportunity to raise awareness and money to help find a cure. This year we’ve partnered with the AiRS Foundation. OHB’s Oktoberfest will be available in cans and on draft August 1st ” says Eric Connolly, Director of Marketing and Events. For this next selection, I chose a brewpub that’s also taking a slightly different approach. First I’ll note that Pinthouse Pizza does not package and distribute their beer; however, they do sell crowlers and growlers on site to-go. Instead of selecting one charity and one distributed beer, Pinthouse creates a small batch brew especially for that month’s selected charity. The list of charities Pinthouse has supported with the program is long indeed, here are a few of the most recent Charity Brew partners: Hospice Austin, Central Texas Food Bank, Austin Parents of Multiples, and Austin Boxer Rescue. Balanced, crisp, citrusy, this beer is brewed with Zilker’s proprietary blend of four different hop varieties highlighting Centennial hops. 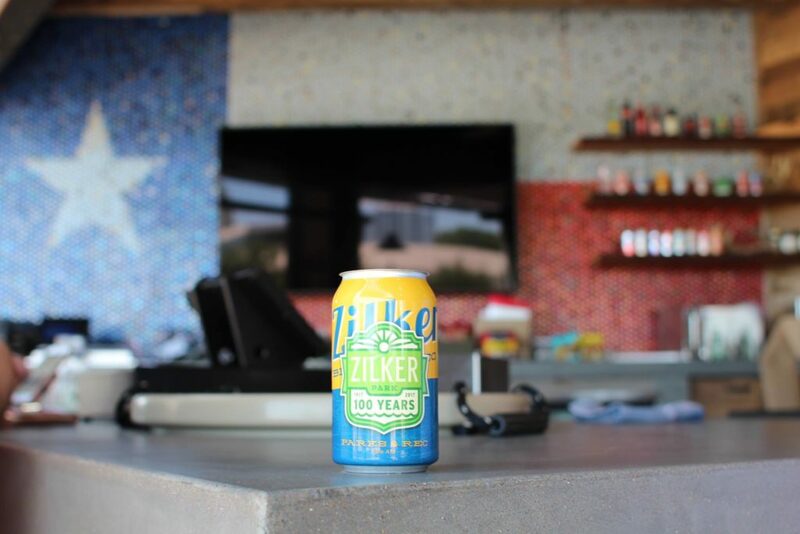 The name Zilker Brewing Company is an homage to philanthropist Andrew Zilker whom Zilker Park is also named, “we’re excited to continue Andrew Zilker’s spirit of philanthropy by donating a portion of the sales proceeds from the ‘Parks & Rec’ to the Austin Parks Foundation“, says Co-Founder Patrick Clark. 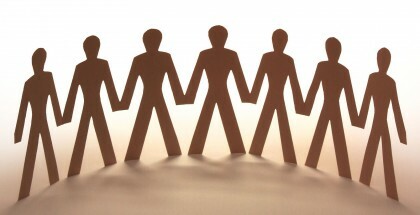 “One of our core values is community. We grew up in Austin. We believe in giving back to enrich our East Austin neighborhood and the city at large. 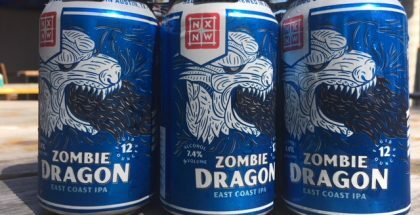 ZBC donates a portion of monthly sales to local charitable causes and we give away beer to worthy philanthropic organizations almost every week. Lastly, there was no way we were passing on an opportunity to brew a beer for one of Austin’s most iconic spaces. We were lucky enough to be approached by APF to collaborate on this once in a lifetime opportunity. The partnership with the Austin Parks Foundation made sense for us because we think Zilker Park and the other public parks in Austin are essential for building and maintaining a sense of community in Austin. We want people to get outside, share a beer with a friend, and enjoy Austin’s 9 months of sunshine. Austin’s park system has been unfunded for some time now, but with help from APF, the parks have become an inviting space to spend time with family and friends. We decided to partner with APF for the reasons mentioned above, but we have also developed a close relationship with the people at APF, and hope to continue to work closely with them in the future.” – Patrick Clark, Co-Founder.